Definition: A multi-item scale is designed to measure the respondent’s attitude towards more than one attribute related to the stimulus object. It is a rating scale comprising of multiple items, where each item is a single question or a statement that needs to be evaluated. The researcher begins with the development of construct of interest. The construct refers to the type of concept existing at the high level of abstraction than do everyday concepts, such as brand loyalty, attitude, product involvement, satisfaction, etc. Next, the researcher develops the theoretical definition of the construct that clearly states or defines the concept or central idea of interest. In order to do so, one needs to have an underlying theory of the construct that can be measured. A defined theory is required not only for the construction of a scale but also for the interpretation of the resulting data. For example, brand loyalty can be advocated by a consistent repurchase of a brand as a result of a respondent’s favorable attitude towards the brand. The construct must be operationalized in such a way that it complies with the theoretical definition. The operational definition implies that which observable characteristics or attributes will be measured and how the numerical score is assigned to each. For example, in the context of tea, a consumer will be characterized as brand loyal if he shows a favorable attitude and must have purchased the same brand of tea for at least five out of last six purchase occasions. In the next step, the initial pool of scale items is generated on the basis of theory, analysis of the secondary data and qualitative research. Out of this, a reduced set of prospective scale items is generated based on a qualitative judgment of a researcher and other expert individuals. The reduced scale items are further reduced in a quantitative manner since these are still too large to constitute a scale. 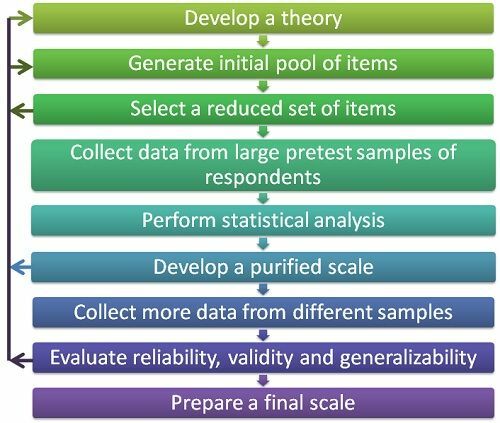 Once the reduced prospective set of scale items is obtained, the researcher collects the data on it from a large pretest sample of respondents. The data obtained is analyzed using the statistical techniques such as correlation, cluster analysis, confirmatory factor analysis, statistical tests, exploratory factor analysis and discriminant analysis. As a result of the statistical analysis, further more items are eliminated, thereby resulting in a purified scale. The purified scale is then evaluated for reliability, validity and generalizability by collecting more data from different samples. As a result of such assessment, a final set of scale items is selected. Note: The development of multi-item scale is an iterative process with several feedback loops, as shown in the figure above. When was the multi item scale article published?